While you may have successfully cut down a tree on your own, most do-it-yourselfers end up with an unsightly stump that they're unsure of what to do with. Stumps are not just unsightly - they can be dangerous, especially depending on the size, and can harm to machinery or people. A stump grinder, otherwise known as a stump cutter is a power tool use for removing unwanted tree stumps- and powerful it is. Stump grinders use a high speed rotating disk to swiftly and efficiently chip away layers of the tree stump. The carbide teeth of the disk grind away the stump laterally into small chips that can easily be disposed or, or used again as material filler or mulch. Because this tool is so powerful, it's use is recommended for experienced users, or professionals. 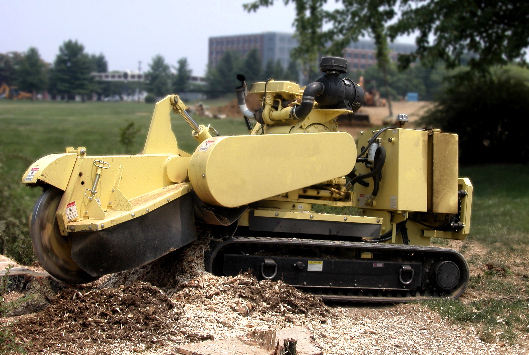 Stump removal is no easy task - and neither is the handling of a stump grinder. We can be the company you can count on to remove your stump in a timely, efficient, safe, and effective manner. We don't leave gaping holes where the stumps used to be. We'll leave your yard looking the way you want it - with holes filled for aesthetic and safety measures, and debris picked up and hauled away.